These highlights do not include all the information needed to use Terbinafine Hydrochloride safely and effectively. See full prescribing information for Terbinafine Hydrochloride. Terbinafine Hydrochloride (Terbinafine Hydrochloride) TABLET for ORAL use. To report SUSPECTED ADVERSE REACTIONS, contact Camber Pharmaceuticals, Inc at 1-866-495-8330 or FDA at 1-800-FDA-1088 or www.fda.gov/medwatch. Terbinafine tablets, USP are indicated for the treatment of onychomycosis of the toenail or fingernail due to dermatophytes (tinea unguium). Terbinafine tablets, 250 mg are supplied as white, round, flat faced beveled edge tablets debossed with IG on one side and 209 on the other. In the majority of liver cases reported in association with terbinafine use, the patients had serious underlying systemic conditions. The severity of hepatic events and/or their outcome may be worse in patients with active or chronic liver disease. Treatment with terbinafine tablets should be discontinued if biochemical or clinical evidence of liver injury develops. Terbinafine tablets are not recommended for patients with chronic or active liver disease. Before prescribing terbinafine tablets, liver function tests should be performed since hepatotoxicity may occur in patients with and without pre-existing liver disease. Periodic monitoring of liver function tests is recommended. Terbinafine tablets should be immediately discontinued in case of elevation of liver function tests. Patients prescribed terbinafine tablets should be warned to report immediately to their physician any symptoms of persistent nausea, anorexia, fatigue, vomiting, right upper abdominal pain or jaundice, dark urine, or pale stools. Patients with these symptoms should discontinue taking oral terbinafine, and the patientâ€™s liver function should be immediately evaluated. Taste disturbance, including taste loss, has been reported with the use of terbinafine tablets. It can be severe enough to result in decreased food intake, weight loss, and depressive symptoms. Taste disturbance may resolve within several weeks after discontinuation of treatment, but may be prolonged (greater than one year), or may be permanent. If symptoms of a taste disturbance occur, terbinafine tablets should be discontinued. Transient decreases in absolute lymphocyte counts (ALC) have been observed in controlled clinical trials. In placebo-controlled trials, 8/465 terbinafine-treated patients (1.7%) and 3/137 placebo-treated patients (2.2%) had decreases in ALC to below 1000/mm3 on two or more occasions. In patients with known or suspected immunodeficiency, physicians should consider monitoring complete blood counts if treatment continues for more than six weeks. Cases of severe neutropenia have been reported. These were reversible upon discontinuation of terbinafine, with or without supportive therapy. If clinical signs and symptoms suggestive of secondary infection occur, a complete blood count should be obtained. If the neutrophil count is <1,000 cells/mm3, terbinafine should be discontinued and supportive management started. The following adverse events have been identified during post-approval use of terbinafine. Because these events are reported voluntarily from a population of uncertain size, it is not always possible to reliably estimate their frequency or establish a causal relationship to drug exposure. 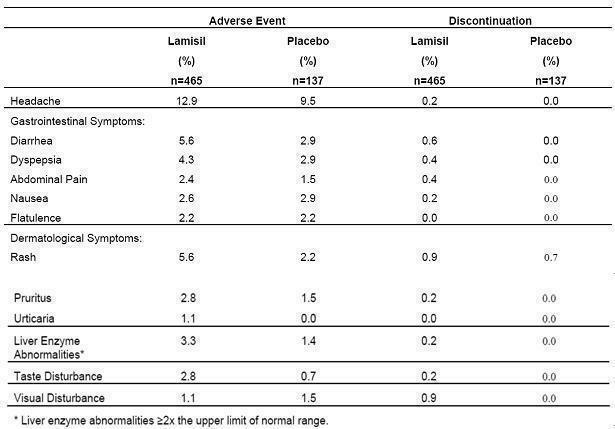 Adverse events, based on worldwide experience with terbinafine tablets use, include: idiosyncratic and symptomatic hepatic injury and more rarely, cases of liver failure, some leading to death or liver transplant, serious skin reactions (e.g., Stevens-Johnson Syndrome and toxic epidermal necrolysis), severe neutropenia, thrombocytopenia, agranulocytosis, pancytopenia, anemia, angioedema, and allergic reactions (including anaphylaxis) [see Warnings and Precautions (5.1, 5.5 , and 5.6)]. Psoriasiform eruptions or exacerbation of psoriasis, acute generalized exanthematous pustulosis and precipitation and exacerbation of cutaneous and systemic lupus erythematosus have been reported in patients taking terbinafine [see Warnings and Precautions (5.7)]. Cases of taste disturbance, including taste loss, have been reported with the use of terbinafine tablets. It can be severe enough to result in decreased food intake, weight loss, and depressive symptoms [see Warnings and Precautions (5.2)]. Depressive symptoms independent of taste disturbance have been reported with use of terbinafine tablets. In some cases, depressive symptoms have been reported to subside with discontinuance of therapy and to recur with reinstitution of therapy [see Warnings and Precautions (5.4)]. Cases of smell disturbance, including smell loss, have been reported with the use of terbinafine tablets [see Warnings and Precautions (5.3)]. Other adverse reactions which have been reported include malaise, fatigue, vomiting, arthralgia, myalgia, rhabdomyolysis, reduced visual acuity, visual field defect, hair loss, serum sickness-like reaction, vasculitis, pancreatitis, influenza-like illness, pyrexia, increased blood creatine phosphokinase, photosensitivity reactions, tinnitus, hearing impairment and vertigo. In vivo studies have shown that terbinafine is an inhibitor of the CYP450 2D6 isozyme. Drugs predominantly metabolized by the CYP450 2D6 isozyme include the following drug classes: tricyclic antidepressants, selective serotonin reuptake inhibitors, beta-blockers, antiarrhythmics class 1C (e.g., flecainide and propafenone) and monoamine oxidase inhibitors Type B. Coadministration of terbinafine should be done with careful monitoring and may require a reduction in dose of the 2D6-metabolized drug. In a study to assess the effects of terbinafine on desipramine in healthy volunteers characterized as normal metabolizers, the administration of terbinafine resulted in a 2-fold increase in Cmax and a 5-fold increase in AUC. In this study, these effects were shown to persist at the last observation at 4 weeks after discontinuation of terbinafine tablets. In studies in healthy subjects characterized as extensive metabolizers of dextromethorphan (antitussive drug and CYP2D6 probe substrate), terbinafine increases the dextromethorphan /dextrorphan metabolite ratio in urine by 16- to 97-fold on average. Thus, terbinafine may convert extensive CYP2D6 metabolizers to poor metabolizers status. The influence of terbinafine on the pharmacokinetics of fluconazole, cotrimoxazole (trimethoprim, sulfamethoxazole), zidovudine or theophylline was not considered to be clinically significant. Co-administration of a single dose of fluconazole (100 mg) with a single dose of terbinafine resulted in a 52% and 69% increase in terbinafine Cmax and AUC, respectively. Fluconazole is an inhibitor of CYP2C9 and CYP3A enzymes. Based on this finding, it is likely that other inhibitors of both CYP2C9 and CYP3A4 (e.g., ketoconazole, amiodarone) may also lead to a substantial increase in the systemic exposure (Cmax and AUC) of terbinafine when concomitantly administered. Terbinafine clearance is increased 100% by rifampin, a CYP450 enzyme inducer, and decreased 33% by cimetidine, a CYP450 enzyme inhibitor. Terbinafine clearance is unaffected by cyclosporine. There is no information available from adequate drug-drug interaction studies with the following classes of drugs: oral contraceptives, hormone replacement therapies, hypoglycemics, phenytoins, thiazide diuretics, and calcium channel blockers. In patients with renal impairment (creatinine clearance less than or equal to 50 mL/min) the use of terbinafine tablets has not been adequately studied. Terbinafine hydrochloride, USP is a white to off-white fine crystalline powder. It is freely soluble in methanol and methylene chloride, soluble in ethanol, and slightly soluble in water. Inactive Ingredients: colloidal silicon dioxide NF, hypromellose USP, magnesium stearate NF, microcrystalline cellulose NF, and sodium starch glycolate NF. Following oral administration, terbinafine is well absorbed (>70%) and the bioavailability of terbinafine tablets as a result of first-pass metabolism is approximately 40%. Peak plasma concentrations of 1 Î¼g/mL appear within 2 hours after a single 250 mg dose; the AUC (area under the curve) is approximately 4.56 Î¼gâˆ™h/mL. An increase in the AUC of terbinafine of less than 20% is observed when terbinafine tablets are administered with food. In patients with renal impairment (creatinine clearance â‰¤ 50 mL/min) or hepatic cirrhosis, the clearance of terbinafine is decreased by approximately 50% compared to normal volunteers. No effect of gender on the blood levels of terbinafine was detected in clinical trials. No clinically relevant age-dependent changes in steady-state plasma concentrations of terbinafine have been reported. Terbinafine, an allylamine antifungal, inhibits biosynthesis of ergosterol, an essential component of fungal cell membrane, via inhibition of squalene epoxidase enzyme. This results in fungal cell death primarily due to the increased membrane permeability mediated by the accumulation of high concentrations of squalene but not due to ergosterol deficiency. Depending on the concentration of the drug and the fungal species test in vitro, terbinafine may be fungicidal. However, the clinical significance of in vitro data is unknown. The efficacy of terbinafine tablets in the treatment of onychomycosis is illustrated by the response of patients with toenail and/or fingernail infections who participated in three US/Canadian placebo-controlled clinical trials. Results of the first toenail study, as assessed at week 48 (12 weeks of treatment with 36 weeks follow-up after completion of therapy), demonstrated mycological cure, defined as simultaneous occurrence of negative KOH plus negative culture, in 70% of patients. Fifty-nine percent (59%) of patients experienced effective treatment (mycological cure plus 0% nail involvement or >5mm of new unaffected nail growth); 38% of patients demonstrated mycological cure plus clinical cure (0% nail involvement). The mean time to overall success was approximately 10 months for the first toenail study and 4 months for the fingernail study. In the first toenail study, for patients evaluated at least six months after achieving clinical cure and at least one year after completing terbinafine therapy, the clinical relapse rate was approximately 15%. Terbinafine tablets, USP are supplied as white, round, flat faced beveled edge tablets debossed with IG on one side and 209 on the other. Store tablets at 20° to 25°C (68° F to 77°F) [See USP Controlled Room Temperature]; in a tight container. Protect from light. Patients should be advised to report to their physician any symptoms of new onset or worsening lupus erythematosus. Symptoms can include erythema, scaling, loss of pigment, and unusual photosensitivity that can result in a rash. Terbinafine treatment should be discontinued. Photosensitivity reactions have been reported with the use of terbinafine tablets. Patients should be advised to minimize exposure to natural and artificial sunlight (tanning beds or UVA/B treatment) while using terbinafine tablets. Read this Patient Information before you start taking terbinafine and each time you get a refill. There may be new information. This information does not take the place of talking to your doctor about your medical condition or your treatment. Terbinafine is a prescription antifungal medicine used to treat fungal infections of the fingernails and toenails (onychomycosis). Your doctor should do tests to check you for fungal infection of your nails before you start terbinafine. It is not known if terbinafine is safe and effective in children for the treatment of onychomycosis. Who should not take terbinafine? Do not take terbinafine if you are allergic to Terbinafine when taken by mouth. are pregnant or plan to become pregnant. It is not known if terbinafine will harm your unborn baby. You should not start using terbinafine during pregnancy without talking with your doctor. are breast-feeding or plan to breast-feed. Some terbinafine passes into your milk and may harm your baby. Talk to your doctor about the best way to feed your baby if you take terbinafine. Take terbinafine exactly as your doctor tells you to take it. Terbinafine comes as a tablet that you take by mouth. You can take terbinafine with or without food. If you forget to take terbinafine, take your tablets as soon as you remember, unless it is less than 4 hours before your next dose is due. In this case, wait and take your next dose at the usual time. What are the possible side effects of terbinafine? Your doctor should do a blood test to check you for liver problems before you take terbinafine. change in smell or loss of smell may happen with terbinafine. This may improve after stopping terbinafine, but may last for a long time or may become permanent. The most common side effects of terbinafine include: headache, diarrhea, rash, dyspepsia, liver enzyme abnormalities, pruritus, taste disturbance, nausea, abdominal pain, and flatulence. Tell your doctor if you have any side effect that bothers you or that does not go away. These are not all of the possible side effects of terbinafine. For information, ask your doctor or pharmacist. How do I Store terbinafine? Store terbinafine tablets at 20° to 25°C (68° F to 77°F). Keep terbinafine in a tightly closed container and away from light. Keep terbinafine and all medicines out of the reach of children. General information about the safe and effective use of terbinafine. Medicines are sometimes prescribed for purposes other than those listed in Patient Information. Do not use terbinafine for a condition for which it was not prescribed. Do not give terbinafine to other people, even if they have the same symptoms that you have. It may harm them. This Patient Information summarizes the most important information about terbinafine. If you would like more information, talk with your doctor. You can ask your pharmacist or doctor for information about terbinafine that is written for health professionals. What are the ingredients in terbinafine? Active ingredient: terbinafine hydrochloride, USP. Inactive ingredients: colloidal silicon dioxide, hypromellose USP, magnesium stearate, microcrystalline cellulose, sodium starch glycolate.